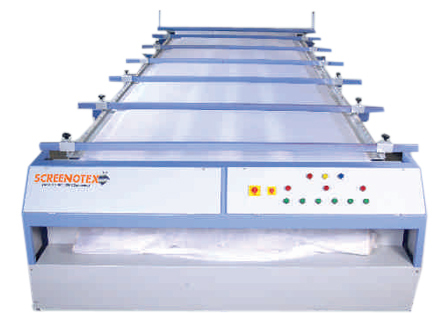 Multi Cage Screen Stretching Machine,Textile Screen Printing Machine,roto flat screen printing machine,Multi Cage Screen Stretching Machine india. This machine enables bolting cloth used in the manufacture of Printing screen, stretched by applying uniform tension in warp & weft sides. A Supporting board allows stretching many frames at the same time. No contact between frame & mesh during stretching process. Simultaneous handling of several screen frames. A rigidly stayed fabricated base frame work ,suitably designed for supporting of the screen Fabric Tensioning arrangement, which comprises of the following:. Mechanically controlled Table for raising the table & accommodating various sizes of screen frames.